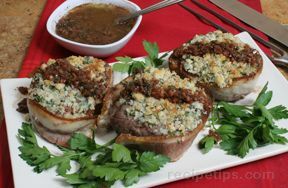 The tanginess of the blue cheese topping and the richness of the red wine sauce make these tender filet steaks a special treat. Melt one tablespoon butter in heavy skillet over medium high heat. Add garlic, shallot and thyme. SautÃ© until shallots are tender, stirring occasionally for approximately 5 minutes. Boil until the sauce is reduced to 1/2 cup, approximately 10-12 minutes. Blend cheese, bread crumbs and parsley in a small bowl. Melt 2 tablespoons of butter in a large, heavy skillet over medium high heat. 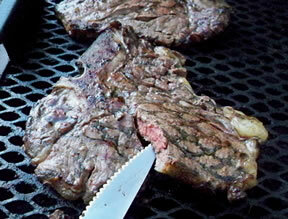 Add steaks to the skillet and cook to desired doneness, five mintes per side for medium rare. 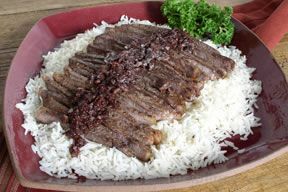 Transfer steaks to a baking sheet. Reserve the skillet with the pan juices. Press cheese mixture on top of steaks, dividing evenly. Broil until the cheese browns, approximately 2 minutes. Pour sauce into the reserved skillet with juices. Bring to a boil, scraping up browned bits. Boil 1-2 minutes, stirring in remaining 1 tablespoon of butter. Season with salt and pepper. Spoon sauce over steaks and serve. "I am very disappointed with with how many stars are available to rate this entree. 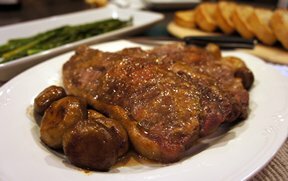 This was by far the best steak I have ever tasted and I have sent this recipe to everyone I know! I need to find more recipes like this one. MUST TRY!!"